Our country has always been famous for a very powerful industry, army. We have much to be proud of. The secrets of our strength and glory can not unravel to this day. Keep the secrets and be vigilant, even urged the Soviet government. What we can see on the bright propaganda posters of those times. Such slogans were created on various subjects. 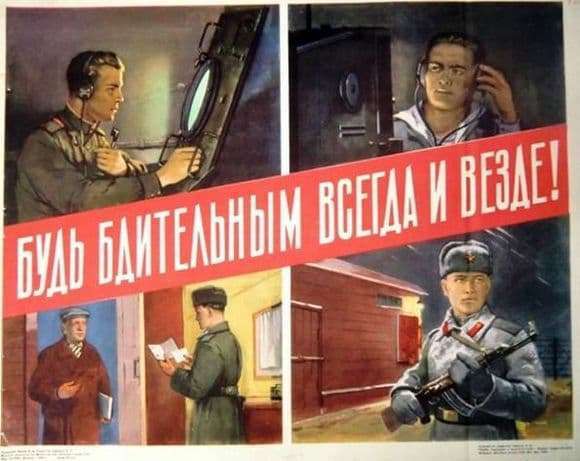 The posters had many plots and variations, where the Soviet man was called for many actions like not to drink, to keep secrets, to be ready for work and defense. A series of posters “Be vigilant” shows us how important it is to always keep what you have been entrusted to. It doesn’t matter who: authorities or relatives. Speaking everywhere without a word of silence, one can say what outsiders should not know. Also on the posters with the plot “Be Vigilant” we can see how the authorities called to be on the alert, to fight against corruption, theft. There is even a plot where the appeal goes to the police officer. Since they are an integral part of the debugged Soviet system. Posters urged to always and everywhere to remember that the enemies are near and, chatting about everything and everyone, can lead the country. The Soviet man had to be honest, strong, proud, intelligent and restrained. His vigilance should never have been shaken. It was firmly embedded in the consciousness of the people of that time, and in order not to forget what it was necessary to strive for, the authorities made appropriate posters. And they had weight on this road to an honest and decent life. Such posters reminded at every step what kind of mentality the Russian people should have. Of course, they could not agitate and motivate. No one wanted to be the one with whom such propaganda fought. It was a good tradition, which has now become a relic of the past, but most of us will agree now that such slogans can positively influence public consciousness. And nowadays they are sometimes so lacking.